Received November 17th, 2011; revised December 22nd, 2011; accepted December 29th, 2011.
in the area, systematic observations and semi-structured interviews. have a certain tradition of depopulation. styles undergoing evident transformation processes (Little, 1999). munity in relation to its immediate and more remote context. dimensions of the social life (Holloway & Kneafsey, 2004). new materialities that function seasonally in depopulated areas. from the cultural transformation of Geography. least partially maintained by Holloway (2002). within rural studies from a Geographical perspective. consequently, are significantly affected by local circumstances. or political implication in the research work (Crang, 2005). tended stay with each interviewee. tial justice, self-identity or relationships with the community. Case Study 1. The Valderredible Valley. and the farming activity is only profitable because of subsidies. nity and a largely mobile population. mass exodus. In social terms, life before the exodus was lively. farms now are bigger than before, around 10 - 14 hectares. will disappear ···” (Mar & sobrepeñilla, April 2010). though, the lifestyle is conditioned by the permanent residents. with the locals ···” (Mar & sobrepeñilla, April 2010). cattle and each farmer needs at least 200 hectares of pasture. cattle farmers have now has been earned over a whole lifetime. grazing rights of each village. tact with the village and started with a small family property. make. All the new cattle farmers inherit their parents’ farm. problems with the seasonal inhabitants visiting in the summer. areas, owing to the high investment required and the low prices. with on a daily basis, especially those related to sanitation. Today, this is one of the reasons some farmers give up the farm. of those who emigrated, or their descendents, return to the area. some extent they are used to living like that, with few people. lems, not only the villages ···” (Fer & rubanales, April 2010). winter. On the whole, they have always lived in the village. opment, “it wasn’t for me”, they longed to return to their homeland. led to loneliness in every case. such as permanent dedication for 365 days a year. ence keeps the councils open and maintains the village rights. this return was motivated by nostalgia, of feelings for the area. pendent on having their own vehicle. their conditions of family life and bringing up the children. it’s every man for himself”. there are around 6 or 7 permanent retired inhabitants”. staying behind. “Those who left don’t live half as well as I do. down in the area, since most of the cattle farms are inherited. and Leon province, which shares a border with the previous area. palities of the valley were united under one council (Map 1). buying a house in the area and transforming it into a business. own car for many aspects of life. increase the real demand for services. made candles, another had a restaurant, others made handicrafts. Orbaneja, May 2010). They were referred to as “the hippies”. feel privileged” (Gal & escalada, June 2010). tively, associated with too much regulation and paperwork. backwards, in relation to its tourism attractions and quality. and the feeling of community is becoming lost. bring up a family and set up their first place of residence. the limited social life and small population. capital, less than an hour away. associated with actions of the authorities. five in the whole valley who need to farm large areas to survive. ing is getting worse and worse ···” (Gal & Sedano, April 2010). the paperwork through ···” (Ber & Esc, April 2010). vice sector and only five in agriculture. the vegetable gardens are looked after now, by the old people. and the constructed space to the place. One family, one village. cult to live a normal life. teracting moral lives in the place, of diverse level and relevance. initiatives, however, are still limited. tion (pp. 251-271). London: Routledge. Emotional geographies (pp. 1-16). Aldershot: Ahsgate. Brown, F., & Hall, D. (2000) Introduction: The paradox of peripherality. In F. Brown and D. Hall (Eds. ), Tourism in peripheral areas (pp. 1-6). Channel View Pub: Clevedon. Castree, N. (2005) Nature. London: Routledge. populations in deve l ope d n at ions. London: Ashgate. ginality: revisiting the West Coast, South Island, New Zealand. Journal of Rural Studies, 2 5, 77-86.
disease epidemic. 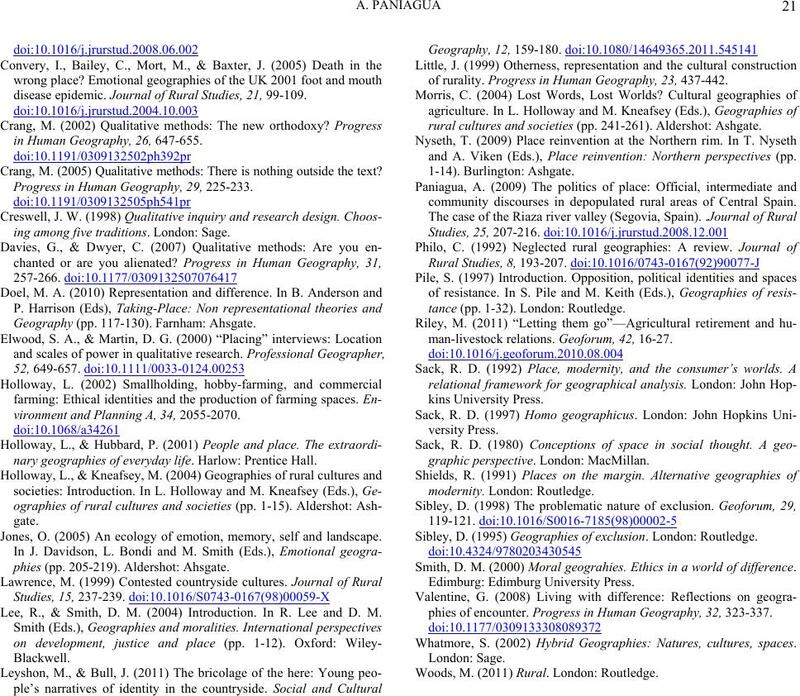 Journal of Rural Studies, 21, 99-109.
in Human Geography, 26, 647-655. Crang, M. (2005) Qualitative methods: There is nothing outside the text? Progress in Human Geography, 29, 225-233.
ing among five traditions. London: Sage. Geography (pp. 117-130). Farnham: Ahsgate. vironment and Planning A, 34, 2055-2070.
nary geographies of everyday life. Harlow: Prentice Hall. Jones, O. (2005) An ecology of emotion, memory, self and landscape. phies (pp. 205-219). Aldershot: Ahsgate. 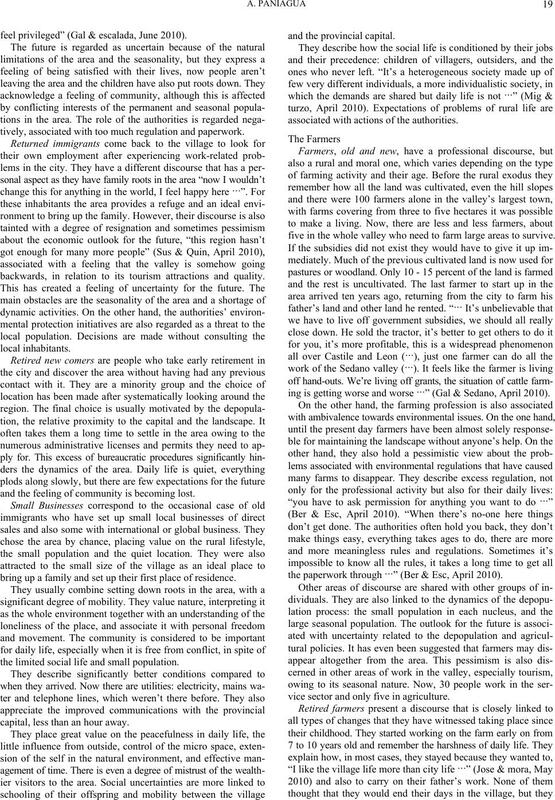 Lee, R., & Smith, D. M. (2004) Introduction. In R. Lee and D. M.
of rurality. 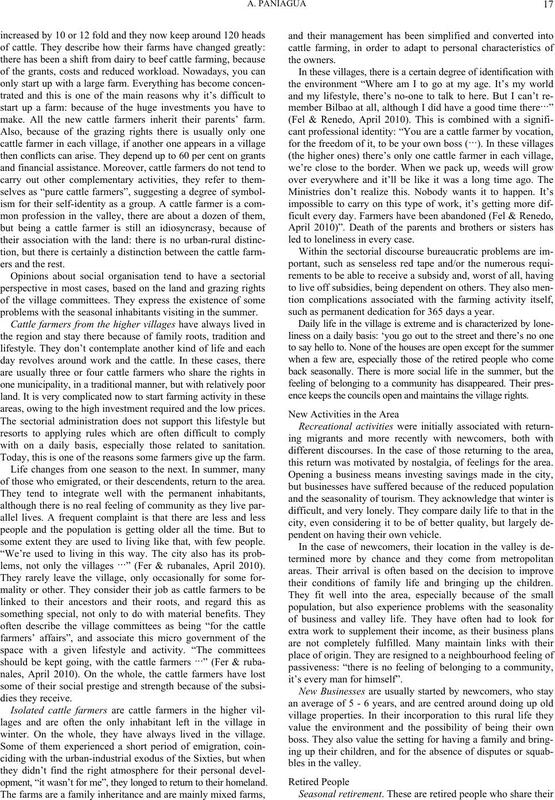 Progress in Human Geography, 23, 437-442.
rural cultures and societies (pp. 241-261). Aldershot: Ashgate. and A. Viken (Eds. ), Place reinvention: Northern perspectives (pp. 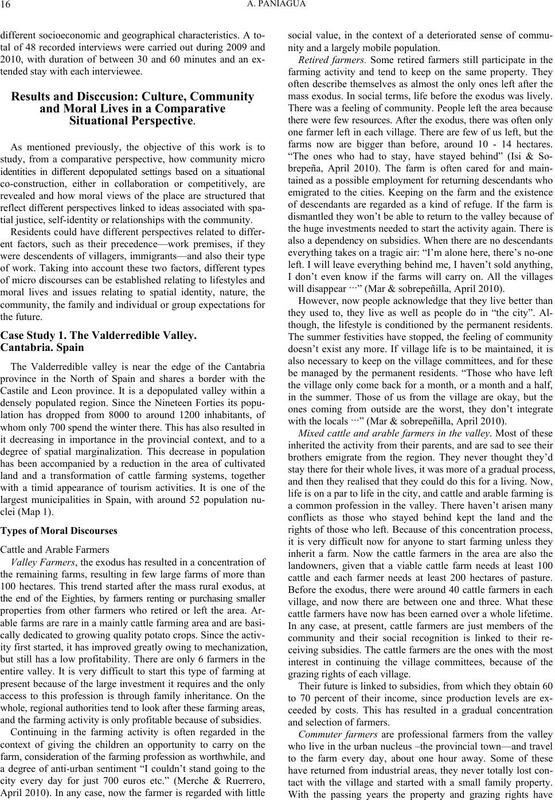 community discourses in depopulated rural areas of Central Spain. tance (pp. 1-32). London: Routledge. man-livestock relations. Geoforum, 42, 16-27. Sibley, D. (1995) Geographies of exclusion. London: Routledge. 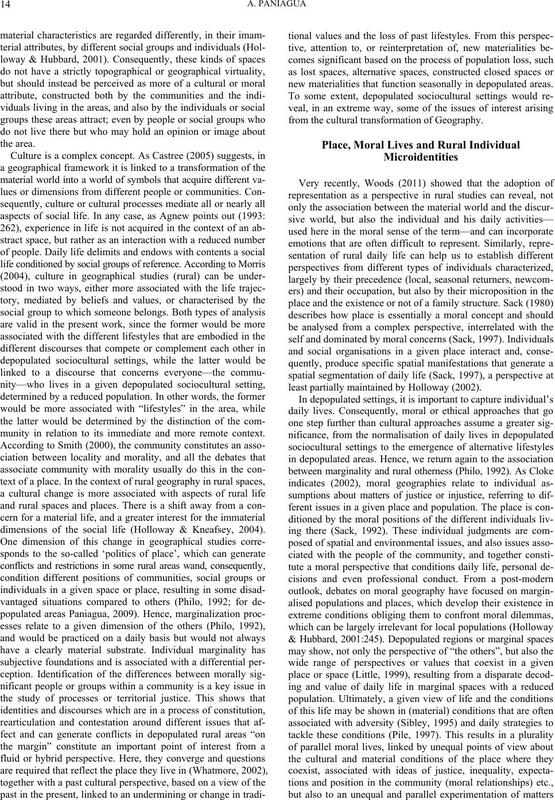 Smith, D. M. (2000) Moral geograhies. Ethics in a world of difference. phies of encounter. Progress in Human Ge og ra phy , 32, 323-337. Whatmore, S. (2002) Hybrid Geographies: Natures, cultures, spaces. Woods, M. (2011) Rural. London: Routledge.